a life member of the orchestra’s Honorary Board of Directors and Chair of the RPYO for 8 years. 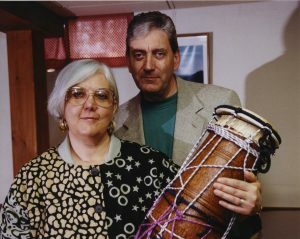 Three-quarters of the RPYO’s percussionists from 1971 to 2017 were Ruth’s students at the Eastman Community Music School, and both Ruth and Bill have coached the RPYO in sectional rehearsals and annual retreats over the years. In 1988 Bill received the Rochester Philharmonic League’s FANFARE AWARD for his “significant contribution to music education in Rochester” and he continues that work today in the “ROCmusic” initiative, a community program bringing music into the lives of young people. Ruth is currently the Chair of the ECMS Wind, Brass and Percussion Department, and is a founder and director of the Music Horizon Program for talented high school students, still going strong after 27 years! She too was in the Rochester Philharmonic – for 32 years – she beat out Bill’s record! Her many accomplishments and undertakings make for a very long and inspiring list. She has students performing professionally in the Chicago Symphony, San Francisco Opera and Atlanta Symphony. At the celebration, Ruth’s DRUM JOY GROUP performed Bob Becker’s piece “Atenteben”. Congratulations, you two! This recognition is most certainly well deserved!